If you’re trying to save money, pay down debt, or both, then you might want to consider skipping your family’s usual summer trip and plan staycations instead. Staycations are inexpensive activities that your family can do at home, or locally, that you can all enjoy without running up an expensive vacation tab. Staycations are far from boring, in fact you may come to prefer them over the hassle of packing, traveling, etc. 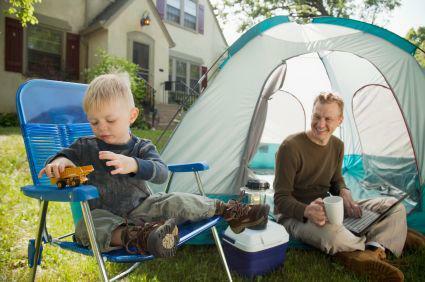 If you’ve got camping equipment, why not camp out in your backyard? You can have just as much fun roasting marshmallows, telling campfire stories and playing outdoors at home as you can at a campground. If you have children, let them invite some of their friends over so that it will feel even more like a group activity. Make it a rule to break your normal routine, so no television, video games or computer time. As a word of caution though, you might have the skip the camp fire if your town has ordinances against it. Waterparks are a great summer attraction, but by the time you add in the cost of admission, parking, and meals, you end up spending a lot of money. As an alternative, head over to Walmart, Target, or another large retailer and pick a Slip ‘n Slide, or make your own, and buy some water guns or water balloons. You can have a great time and cool off on a hot day for a fraction of what a day at a water park would cost, just be reasonable about your water usage and don’t leave the hose running too long or you’ll get a surprisingly high water bill. Instead of springing for an expensive gathering, have a potluck party where everyone brings a dish or some other item. The adults can socialize while the kids are playing. Invite neighbors, family members or whoever you’d like. It’s a great way to have all the fun of a night out on the town without spending a lot of money. Have a sign-up list and keep track of who is bringing what so that you have all the necessities like paper plates, soda, etc. If you have a lot of friends the neighborhood, you might even want to turn it into a block party! If you’re dying to get out of the house, but you don’t want to spend a lot of money, then try some local venues. For example, you could have a nice picnic in a nearby park. Many libraries have great areas for kids where they can listen to a story, or browse through DVDs they’d like watch. State parks are also great venues for an inexpensive day out where you can go hiking, have a picnic or possibly even go paddle-boating. For more creative options, find a national park instead, because many offer low cost tours and other activities. Geocaching is the new high-tech form of treasure hunting using a GPS-enabled cell phone. You sign up at geocaching.com, download the app and find geocaching sites near your location. The website offer both free and paid memberships depending on which you choose. You can also share your finds on the website with other treasure hunters, and who knows, you might possibly even make some new friends. The website has a database of millions of geocaching locations, so you could plan a day just driving around to different sites to see what you find. If you have active kids who need to get out of the house for a while, plan afield day either in your backyard or at a local park. Have events like three-legged races, a water balloon toss and other creative ideas to help pass the time. This idea takes a little bit of planning, but it will make for a fun day that doesn’t cost very much. You can create ribbons for the winners, or offer them inexpensive prizes. It’s a great way for them to burn off some energy and you’ll have fun watching them compete at the games you’ve come up with. There’s something to be said for the fun of sitting around the family table playing board games. Choose a day where everyone gets together and plays a board game. You can often find board games that are inexpensive at thrift stores, although it is a good idea to check them to make sure all the pieces are there before you buy one. After your done playing games for the day, make a huge bowel of popcorn and spend the rest of the night watching movies. The combination will make for a fun, relaxing day and your family can enjoy spending time together. Most people get so used to where they live that they forget what local attractions are available to them. Does your area have museums? Check your local newspaper for free or low-cost events that you can go to. Try to view your area like a tourist and looking for new and exciting places to go instead of your usual hangouts. If you happen to leave near a beach, that’s even better because you can swim, get a tan, or just enjoy being out in the sun. Ask your friends for ideas as well; maybe they know about local activities that you don’t. According to debtconsolidation.com, the average family vacation costs $1,415. However, you don’t have to spend that kind of money in order to have a good time with your family. Experiment and try different ideas to see what works best for you and your family. Some might work out better than others do. Whatever ideas you come up with should be fun and allow you all to spend some quality time together away from the normal routine of your daily lives. About the Author: Tony Standin is a personal finance writer who loves to save money, live an eco-friendly life, and enjoy time with his family. He wants you to be able to do the same! We occasionally take a small staycation…but we usually end up working! Holly, that’s a huge problem for me, too. I can’t seem to break away for a full day! Hey, house party can be fun! And so can all of Houston’s restaurants and bars. But we prefer to get away for at least 2 nights. Have a squirrely day! I think that’s a great idea, CJ! Even close to home we have some really nice bed and breakfast options. You don’t have to go far but you’re still not “home”! We don’t take many vacations throughout the year, so many of my time off from work is spent around the house – which I’m fine with . But a camping trip once or twice a year to a near by camp ground is the perfect get-away for the summer. That was actually how I learned to camp. I started in the backyard and then I went to a campground that was – literally – a mile from the house. I learned the skills and had a back-up (going home) and was able to prepare for my first real trip later on! Love this! We are starting to enjoy more frugal days around our city and have come to really enjoy it. Fantastic! What city are you from, Michelle? I love the geocaching advice. I’ve only recently been reading about this and it just sounds like a blast. I haven’t actually tried geocaching myself yet, but my best friend’s family loves it! I think that’s on the list of things to do later this month (if the heat wave breaks)! Good stuff. With the rising cost of gasoline, we’re doing now “staytrips” instead of daytrips. We’re fortunate that we have several beautiful walks we can take from our home and a couple of markets where we can walk to get the day’s groceries, and we have decent transit service to get us to other places in town. And we can take a beautiful ferry ride to Vancouver for a day in the big city! My aim is to leave the car untouched 3-4 days per week. That’s a wonderful goal! Unfortunately, for me, my only option is to drive or take the bus, and we’re not in a huge city so that’s not actually economical from a time standpoint. I love that you have things so close to your home! I snuck over from Canadian Budget Binder…. My hubby loves camping and we have a camp ground about 3 miles from here. He’s happy to go there by himself although he hasn’t gone camping in a couple of years (health issues) while I stay home and enjoy the peace and quiet. He has fussed about having a cheap camping trip a few times and I have suggested that he pitch the tent in the back yard and I’ll lock him out for the night!!! Lol!! He didn’t think it was funny but the rest of us did. He loves going for the campfire and our backyard just isn’t big enough to get a fire permit for him. Regardless our gas price just went up around here big time so we won’t be driving anywhere until it comes back down…. Staycation is a great way to save money, but it is still good to have a vacation in a different area or country to really be able to take that much needed break. There are just too many distractions at home and oftentimes I ended up doing the day to day tasks that I should not be doing when on a vacation. I do understand. It’s tough these days, for a lot of people. I have a friend who is saving for a Disney vacation – in three years. They do staycations and daytrips now but the kids are fully invested in their Disney goal, and are actually excited about saving, too! After living in Los Angeles for 40 years, I discovered some hidden sights. A number of years ago, we went to Frank Lloyd Wright house, Gamble House and other hidden treasures. You can find some really great things locally in every area. I just had one of those days yesterday in LA while I was serving jury duty downtown. There were so many things I haven’t seen yet downtown. If it weren’t for traffic and parking I’d definitely take advantage of more things in LA. I was visiting a friend in NJ, in a totally unassuming town, and realized that they had an underground railroad museum. Imagine my surprise at finding that! It’s amazing what you can find in the cities you’ve been around for so long. I love really close to Philadelphia, so you’d think I would have seen all of the cool historic stuff, but I keep uncovering tiny little surprises! Geocaching sounds like it would be a lot of fun. I think so, too, Sean. Like I said earlier – waiting for the heatwave to break so the family can give it a try! Staycations can be great because it takes the hassle and expense that comes with going from point a to point b, packing, making arrangements, etc. Plus you’ll find there is a lot to discover if you look a little harder around your own town. I agree! Throwing a bag together for one day is a lot less stressful! I often have visitors as I move countries often so we take days off with them to explore the surroundings, when you are new to an area there is always a lot to see, wherever you are. My old town had free guided tours and they were really enjoyable to get to know the history of a part of town you don’t know much about. Great ideas for staycations, will have to plan a couple of these with the little one. Thanks for the insight! There are definitely many ways to enjoy your vacation without having to travel and spend a lot of money. Camping out in your backyard is one way of having a good time with your loved ones. The local park is another option. Still another is playing with the kids. Be frugal and yet relish these weekends with the entire family. I love it! My family lives in Hawaii, so these ideas are great… we already live in a destination location, and travel FROM Hawaii to anywhere else is prohibitively expensive…looking forward to hosting a backyard water park/potluck party! Camping out in the back yard is a great idea. We plan to do this some time soon before the end of summer!